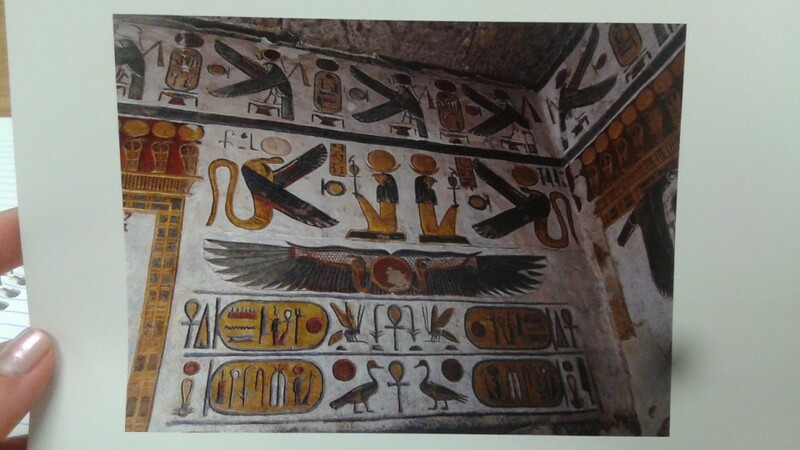 This image is an example of egyptian hierogliphics. A codified language by logographics and alphabetic elements, figurative and symbolic. The images were plasmated in a pigmented white wall. This makes the colors of the figures in blue, red,yellow and green to look stronger. Some of the figures are : Winged cobra, insects, falcons and small birds. In some occasions the creatures face each other which gives the feeling of symethric movement. Some of the other creatures face to the right or left which from the point of view of time it could be that they face the future or past. The elements could represent illusions or more realistic situations. The elements are symplified from its original appeareance.